Tecnal SAS is a french company specialised in designing, manufacturing, and setting up dairy and cheese-making installations. Tecnal is more than 100 people focusing their energy and passion through our engineering departments (Process, Mechanization, Electricity-Automation). It is more than 70 engineers, technicians, hydraulic, thermal, automation and mechanical specialists here to serve our customers by innovating and building successful dairy and cheese dairy production lines. Tecnal is also a cheese-making know-how acknowledged worldwide with a testing laboratory made available for our cheese-making customers in strictest confidence. Tecnal is a network of agents and industrial partners who enable us to provide turnkey solutions anywhere in the world. 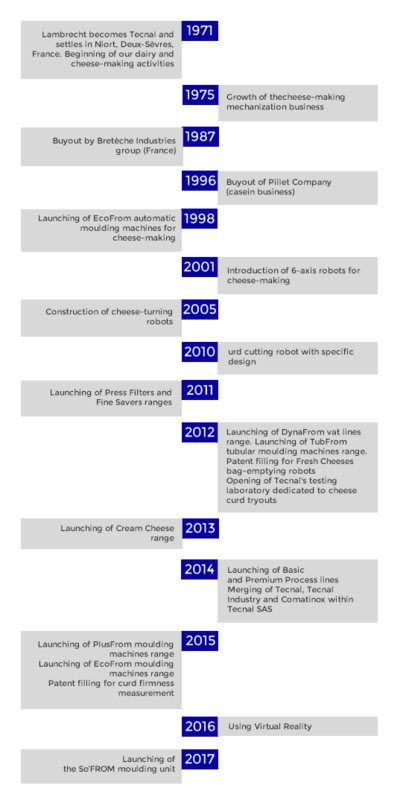 Tecnal is a network of partners that enable us to incorporate the latest technology, the latest developments applied to a constantly evolving cheese-making world. TECNAL, worldwide contractor and integrator, specialized in the supply of completely automated turnkey solutions.